The other day I pulled up my potatoes from this year’s growing-potatoes-in-a-bucket experiment. Let’s just say that if I had to live off my potato crop this winter, I’d be eating a lot of stone soup. I dug up the first, smaller container first (which was a large flower pot of the sort that people often use to grow mums and such). I apparently had overwatered, as the soil was really wet still and the potatoes were too. A few had started to get not quite moldy, but a little smooshy. 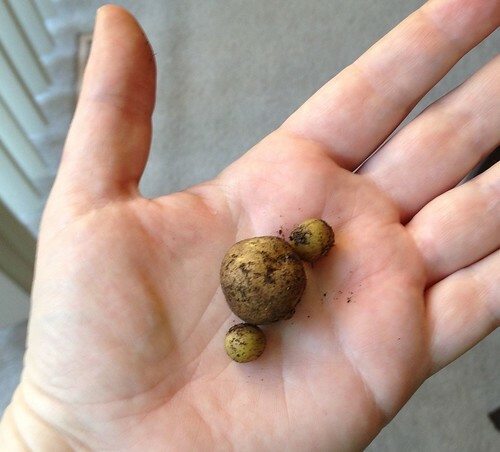 Still, I got maybe a pound of potatoes out of it, with most being reasonably sized, and a few of these hilarious miniscule new potatoes (here’s a photo of them in my hand for scale). I had better hopes for the larger container, which was a repurposed garbage container that a previous tenant had left in our backyard. But once I started getting into it, I found a whole bunch of bugs that looked somewhat like silverfish. The potatoes I looked at had tiny holes in them that the bugs had presumably eaten through. I didn’t want to bring bugs into the house or eat messed up potatoes, so I left the whole thing outside and then put it all in the compost heap. I’m unclear whether the wetter environment helped or hurt as far as that’s concerned. I googled about various potato-eating insects but so far I haven’t seen any pictures that match, so I don’t know if it was a potato thing, or just a crime of opportunity, so to speak.